Is é Launceston cathair atá suite sa Ghleann Tamar i dtuaisceart na Tasmáine, an Astráil. Sruathaíonn an Abhainn Tamar agus a gcraobh-aibhneacha (an Esk Thuaidh agus an Esk Theas) tríd an chathair. Bhunaigh na hEorpaigh Launceston i Mí an Márta, 1806. 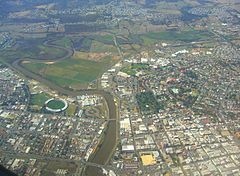 ↑ (Béarla) "Daonáireamh 2006 'QuickStats' – Launceston (Urban Centre/Locality)", Australian Bureau of Statistics (25 Deireadh Fómhair, 2007). ↑ (Béarla) "Climate statistics for Australian locations – Launceston (Ti Tree Bend)", Bureau of Meteorology (20 Eanáir, 2011). Tugadh an leathanach seo cothrom le dáta an 12 Iúil 2017 ag 08:08.